The NHL playoffs are packed full of NCAA alumni once again, ranging from top line game-changers all the way down to backup netminders. 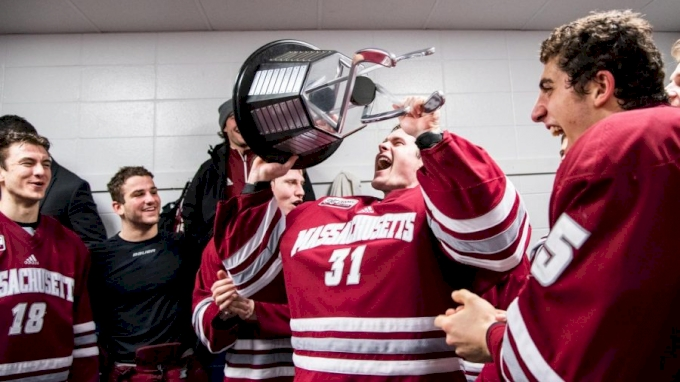 Some names will change as postseason rosters take shape ahead of the opening games on Wednesday, but more than 90 NCAA alumni across Hockey East, the Big Ten, NCHC, ECAC, and WCHA will join their respective NHL teams in the hunt for the 2019 Stanley Cup. Fifteen alumni return to the postseason having already earned their name on the trophy—some twice—but household names varying from veterans to rookies will look to end their season watching their name etched upon the Stanley Cup. All 16 teams competing in the 2019 NHL playoffs have at least one collegiate alumnus on its roster, with upwards of 50 forwards, 30 defensemen, and five goalies crossing the threshold into the playoffs. Former Boston College forward Johnny Gaudreau leads all NCAA alumni in scoring heading into the playoffs with 99 points (36 G, 63 A) in 82 games. Gaudreau played three seasons with the Eagles, where he scored an incredible 175 points (78 G, 97A) in 119 games and won the 2014 Hobey Baker Award. Since he entered the NHL in 2014 with the Calgary Flames, only six players have accumulated more points than Gaudreau’s 386 (132 G, 254 A). In the goal-scoring department, Columbus Blue Jackets forward Cam Atkinson led all former collegiate players with 41 goals, good enough for sixth in the league. Atkinson, another product of Boston College, was a substantial goal-scorer for the Eagles with 68 tallies in 117 games. In recent years with Columbus, he’s begun to find the back of the net more consistently with 100 goals over his past three seasons, which places him 15th in the league. Then there’s Blake Wheeler. Wheeler had three strong seasons as a Minnesota Golden Gopher without any one eye-popping category, but he has been among the best playmakers in the NHL the past several seasons. His 239 assists rank third since the start of the 2015-16 season. Coincidentally, he finished third this year with 71 assists, as well. Each of the three players have proven to be leaders for their organizations and are three of 10 alumni that don a captaincy letter with three captains and seven assistants coming from the college ranks. The talent pool is much larger and deeper than these three highlighted players and still includes names such as Joe Pavelski, Jake Guentzel, and T.J. Oshie. A total of 31 different NCAA programs have at least one representative heading into the 2019 playoffs, as college hockey continues to be a strong path to the NHL. Hockey East continues to be a trendsetter with 31 alumni, followed closely by the Big Ten’s 28 players. Meanwhile, the Big Ten’s University of Michigan leads all programs with 10 alumni competing for the Stanley Cup this spring. While the bulk of college hockey can be found in the east, the balance is rather steady with 47 players competing in the Eastern Conference and 45 players in the Western Conference. The 2016 and 2017 Stanley Cup Champion Pittsburgh Penguins lead the way for alumni with 12 players. The Boston Bruins’ 10 alumni are close behind. On the other end of the spectrum, the runaway Presidents’ Trophy-winner Tampa Bay and odds-on Cup favorite, only has two alumni. While some players may be left off their team’s final playoff roster, don’t miss out on watching your favorite school’s alumni compete for the 2019 Stanley Cup when the postseason gets underway Wednesday night.